Sonatas for Piano Violin KV 303, 377, 378, 481 - Vol. 3 (D. Sitkovetsky, K. Lifschitz) - MOZART W. A. 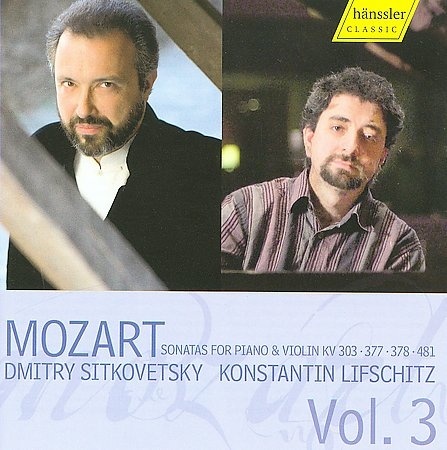 This is the third volume of Mozart's Sonatas for Violin and Piano as recorded by Konstantin Lifschitz and Dmitry Sitkovetsky. These interpretations do not rely upon sterile "Historically Informed Performance" theories but are richly romantic and full-bodied.For more than three decades, Dmitry Sitkovetsky has enjoyed a career as an internationally acclaimed violinist. His accompanist, Konstantin Lifschitz belongs to the ranks of rising pianists of the recent generation. Together, they have created an exciting and multi-faceted survey of the Mozart Sonatas for Violin and Piano.